Recently the Monterey Herald published an article on The Living Breath Foundation. Take a look! Having one child grow up with cystic fibrosis, the debilitative disease that primarily affects the lungs, would have been difficult enough for the Pappageorgas family. But when both of their children were diagnosed in their early teens, Chris and Lori Pappageorgas faced the challenge with determination. Now, they are working to pass on that determination to other families who are dealing with the disease through their Living Breath Foundation. Formed in 2008, the foundation (www.thelivingbreathfoundation.com) has already raised more than $285,000 and distributed more than $200,000 to further research and provide financial assistance to cystic fibrosis patients and their family members. They started the foundation after recognizing the need for financial assistance based on their own experiences as parents. Both of their children, Nick, 26, and Melissa, 24, were diagnosed with the disease in high school. "We wanted to provide for those others' needs," said Chris Pappageorgas, a licensed carpenter who works with Harvest Construction in Monterey. His wife Lori has worked in the dental field for 35 years and is currently on disability. According to the Cystic Fibrosis Foundation Web site, cystic fibrosis is an inherited, chronic disease that affects the lungs and digestive system of about 30,000 children and adults in the United States (70,000 worldwide). A defective gene and its protein product cause the body to produce unusually thick, sticky mucus that clogs the lungs and leads to life-threatening lung infections. It can also obstruct the pancreas and stop natural enzymes from helping the body break down and absorb food. It's a complicated disease, and a big part of the Pappageorgas' push has been to inform the local community. "You've heard the name, but don't really know what (cystic fibrosis) is," said Lori Pappageorgas. The Pappageorgas' case of having two children with the disease appears rare considering the relatively small number of patients in the United States, but it's not improbable. According to the couple, 1 in 29 Caucasians are carriers of the gene that causes the disease. Both Chris and Lori are carriers, so their probability of having a child with cystic fibrosis was 1 in 4. "The odds were the same for each child," said Lori Pappageorgas. "It's the odds of being with someone who has the gene as well (that are low)." 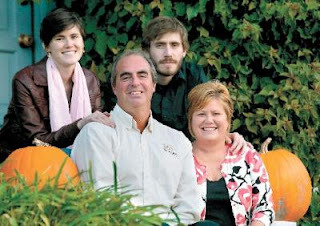 The Pappageorgas' children were diagnosed later than most, so the family got a late start on the demand of treatments. Their children have routinely made hospital visits up to three or four times a month. In September, Nick was admitted early in the month, while Melissa had a stay toward the end of the month. "It's a tremendously time-intensive treatment. Up to three hours a day of treatment," said Lori Pappageorgas. "It's a very difficult disease to manage. You can't manage it and maintain an eight-hour workday." Knowing the ins and outs of treatment, the costs of traveling to out-of-town specialists and the out-of-pocket expenses involved, the Pappageorgases figured their best bet for helping was to give individual assistance. Pappageorgas contributions have helped 15 individuals and families in Monterey County and throughout the state over the last two months. This year, they were able to help a 9-year-old girl from Oakland who was in the advanced stages of the disease. They provided her with a portable machine that converts room air into pure oxygen. The family's insurance company would only spring for a stationary device. The mobile machine, which runs for roughly $5,000, will allow her to leave the house while she battles the disease. "It's going to allow her to attend school. We're allowing her some freedom," said Chris Pappageorgas. "When you're in the advanced stages like she is, who wants to be stuck at home?" A social worker who had heart about Living Breath sought out the Pappageorgases and referred the girl. Lori Pappageorgas said they are now starting to get more referrals that way. "We've been inundated. It's not only the word that we're out there, but that we're able to help," said Lori Pappageorgas. That help has been extended to college students, in the form of three scholarships totaling $12,500. A single mother raising a child with the disease has gotten some support. Another young adult, recently unemployed and trying to keep bills, was given financial assistance. The Pappageorgas did not reveal the names of the recipients, but said they hand over the money individually after getting a referral. They have not turned anyone away seeking help, but they know they can only do so much. Chris Pappageorgas said their assistance is at best a temporary fix. "Everyone of them are behind. Just trying to make ends meet. This helps so they can at least catch up," he said. "At least it relieves a lot of stress for them at the time." Locally, the family knows of about a dozen local carriers. The family has worked to meet with them and help those that seek out assistance. "Those are just the ones we know of," said Chris Pappageorgas. "We're trying to be active in the local cystic fibrosis community."